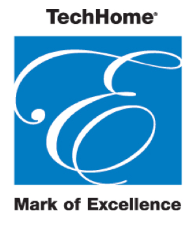 Framingham, MA – January 6, 2017 – Recognizing groundbreaking consumer electronics technologies and installations, the Consumer Technology Association (CTA) in conjunction with CE Pro magazine held the 2017 Mark of Excellence Awards at CES 2017, Las Vegas. Presented in an evening ceremony at the Venetian Hotel in Las Vegas, the Mark of Excellence Awards recognize some of the best residential and commercial custom installation projects performed by professional integrators, as well as top consumer technology products and services that are primarily targeted at the custom installation channel. The 157 entries were judged by an independent panel of industry experts. Winners of these prestigious awards receive exposure via the websites and print publications from the Consumer Technology Association and CE Pro. Consumer Technology Association (CTA)TM, formerly Consumer Electronics Association (CEA)®, is the trade association representing the $285 billion U.S. consumer technology industry. More than 2,200 companies – 80 percent are small businesses and startups; others are among the world’s best known brands – enjoy the benefits of CTA membership including policy advocacy, market research, technical education, industry promotion, standards development and the fostering of business and strategic relationships. CTA also owns and produces CES® – the world’s gathering place for all who thrive on the business of consumer technology. Profits from CES are reinvested into CTA’s industry services.